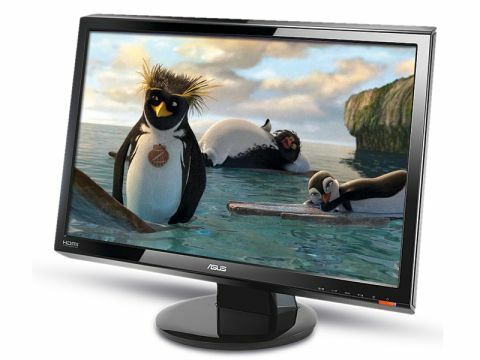 The Asus VH242H features a 24-inch widescreen display with a Full HD resolution of 1920 x 1080 pixels. The monitor looks very much like an LCD television, with a high-gloss black finish and a solid but overly large stand. The stand allows for a little forward tilt, but you won't be able to raise the screen as height-adjustment isn't supported. The bezel of the screen is only broken up by the control buttons in the right-hand corner. The button descriptions are in grey writing, which is fine when you're in well lit conditions, but proves harder to read in a darker room. That said, with the standard array of menu controls, we found setting up this monitor to be quick and easy. When it comes to connections you'll find the VH242H pretty much sets the standard, as it comes with a VGA port for connecting to older analogue laptops, while those with the latest machines can take full advantage of either DVI or HDMI connections for a full digital and high-definition (HD) signal. With a native resolution of 1920 x 1080 pixels, you'll be able to make the most of your laptop's Blu-ray drive, as the HDMI signal sends both images and audio to the monitor. Naturally, you'll only be able to take advantage of the high-end resolution when using the digital inputs. With a set of two-watt stereo speakers built in, we found this the best way to watch movies. The screen has a nice, bright image and quality more than lived up to expectations. Colours have a good amount of contrast and flesh tones looked sharp when playing movies. The one problem we had with this screen, however, was the rather narrow viewing angle, with a haze cast over the screen when not viewing from straight on. Overall, the Asus VH242H offers a great experience for the price. While it's not the brightest or most cutting-edge design, its reasonable price and strong image quality mean it'll prove more than usable in the office or home.